I’ve been missing DS McAvoy so it was a relief to finally catch up on book 6 in the series. This book sees McAvoy even further out of his comfort zone than normal as the action takes place in New York City. Three Irishmen who have arrived in New York, one is dead, one is in a coma and one is missing. As the missing one is Roisin’s little brother strings have been pulled and McAvoy has been allowed to cross the Atlantic to see if he can find out what’s happened – because if he can’t a huge family feud will engulf those he loves. If there’s one thing that drives McAvoy it’s his love for his wife! If McAvoy normally seems like a fish out of water then the change of environment does nothing to improve the situation but he remains true to his character in his dogged determination to get to the bottom of whatever mystery he’s presented with. He’s given a contact in the NYPD and the Detective seems like a decent guy but it doesn’t take McAvoy long to realise that he is being played in all sorts of ways. Detective Alto has his own agenda and he’s happy to try to manipulate McAvoy to get what he wants. The author makes the most of the location – with Irish priests, bare knuckle fighting, Feds, Mafia mobsters and Chechen gangs. The book picks up some of the atmosphere of New York but with a wintery setting it shares a lot in common with Hull. The story (as is usual in this series) is complex with lots of seemingly disconnected threads. This is perhaps the reason that the opening of the book feels a little disjointed; there are a number of different points of view and it’s not clear at the start (in some cases it isn’t actually resolved until the end of the book) who the characters are. Like a jigsaw all the pieces come together to make a satisfying final result but for some of the way it felt like there were a few annoying bits of sky lying about that were never going to fit in! This is a challenging read. The topics the books tackles and some of the violence are at the opposite end of the crime fiction scale to ‘cosy’. There is some brutal violence and some depraved behaviour, it’s complex and you need to keep your wits about you. It’s great getting reacquainted with McAvoy again but the change of location did mean that, for me, there were some downsides. I missed the team spirit that closer proximity to his colleagues would normally give and a disembodied Trish Pharaoh via Skype is a pale imitation of the real thing. There have been some storylines in earlier books in the series concerning McAvoy’s colleagues that I really wanted to see develop or be resolved but these were neglected. And of course there’s Roisin and Aector together – a force to be reckoned with but not quite the same when they are on different continents. An enjoyable if challenging read but not quite Aector McAvoy at this best. Thank you to the library for letting me borrow the book. You can see another point of view on Puzzle Doctor’s blog. This is a personal look at the books I’m looking forward to reading next year. There are a few debuts, a few series that I really should catch up on and the climax to one specific series that I just can’t wait for! First on the list must be Turn a Blind Eye by Vicky Newham which is due to be published on 5 April 2018. I first met Vicky not long after I started blogging and we have been friends since. When I first met people as a blogger I seemed unusual in being someone who was only interested in reading books with no desire to become a writer myself. Over the intervening years I’ve seen many of these bloggers become published authors (people like Sarah Ward, James Law, Steph Broadribb) and it’s been a long wait for Vicky! The good news is that she will be published by HQ books (part of Harper Collins) so she should get lots of publicity and support. They’ve already done a great job on the cover! The book does sound intriguing too “When the head teacher of Mile End High School is found brutally murdered, DI Maya Rahman is called in to the East End community – an area buzzing with energy, yet divided by its own multiculturalism. Maya must battle ghosts from her past and navigate East London’s cultural tensions to find the perpetrator before they kill again.”. As a fan of police procedurals this is right up my street and Vicky is bringing in an extra dimension with a Bangladeshi female detective and a Tower Hamlets setting. Not only did HQ by the rights to two books but TV rights sold to Playground Entertainment so fingers crossed that this develops into something we get to see on screen too. Next on the list is another debut – this is Strangers on a Bridge by Louise Mangos and is due to be published in August 2018 by HQ Digital, again part of Harper Collins. Louise is another debut author that I’ve met at a number of crime fiction events. Despite having an agent she made her ‘pitch’ to HQ via a tweet when they were asking for authors to do just that and following the tweet they made contact with Louise and she subsequently signed to them. Who says social media is all bad? A psychological thriller the blurb is ‘While running near her home in Switzerland, English-born Alice stops a man jumping from a notorious suicide bridge. He mistakes Alice’s euphoric relief as budding affection, and he begins to stalk her.’ While the premise sounds intriguing I definitely don’t read enough books set in Switzerland so I’m looking forward to a bit of armchair-tourism too. I didn’t post a roundup of my reading highlights for 2017 – there were a couple of reasons for this. First my blog was pretty neglected in the first half of the year with a house move coinciding with a period at work that was both busy and stressful. I’ve done about the same amount of reading as I normally would but it’s been too time-consuming to get all the reviews posted on my blog. But I also felt that there weren’t any absolutely ‘five-star’ standout books in what I’d read. I did ask around on Facebook for some suggestions of what I might have missed and I’ve also had a look at many of the other ‘best of 2017’ lists. Taking all of this into account and scouring the lists on Crime Time I made sure to ask for Bluebird, Bluebird by Attica Locke for Christmas and I’m pleased to say that Santa did his stuff. The only hold up may be the fact that as a hardback I shan’t want to take it to work on the train as I like to keep my books in pristine condition! I’ve always tried to read books in the correct series order and if I have started a series from the beginning I don’t want to skip a book and miss something important. There are a couple of series that I’ve got behind on and I really need to catch up. I feel a particular affinity to these as I read and reviewed the debuts on my blog. Firstly there’s Sarah Hilary’s Marnie Rome series. I’ve read the first three books in the series but missed out on the fourth and can see some reviewers have already received copies of the fifth book, so I need to get myself the two missing titles and squeeze them in to my reading next year. There is a third set of books to add to this and I did make an exception and read some of this series out of order. It’s the Nic Costa series by David Hewson. When David stopped writing this series set in Italy I didn’t feel any pressure to fill in any gaps but with a new book due out in 2018 I shall have to get my skates on to catch up. I have posted reviews on my blog for The Fallen Angel which was the last Nic Costa novel and Carnival for the Dead which was a spin off from the series. You can read more about David’s announcement on his blog. There is also a series coming to an end which although I shall be sad to see it finish I am REALLY looking forward to reading the final instalment. This is the Frieda Klein series from Nicci French. I wasn’t sure how a move from standalones to a series of eight books would work but I shouldn’t have worried. The series has been excellent – one you really should read from the start to get the most out of the books. But July will see the final book published and I shall be rushing to read it because I would hate to see a spoiler! So what have ai missed? What books are your must haves or must reads for the next year? I’ve been enjoying Mark’s Aector McAvoy series, and I made sure to get a review copy (well Netgalley) of this fifth outing for McAvoy. The story centres around a missing girl and some slightly bizarre behaviour concerning body hair and specifically armpits! McAvoy becomes too personally involved in the hunt for the missing girl (taking his young family picnicking close to where she was last seen) which, as we’ve come to expect to from Mark, has consequences for the detective. There are always multiple threads in this series of books and in Dead Pretty the spotlight shines on McAvoy’s boss Trish Pharaoh who is in trouble on a number of fronts. There is the matter of some ‘muscle’ sent to collect on a long-outstanding debt and a man Pharaoh had arrested for murder has been released on appeal due to the failings of her own team. While she is dealing with her own battles, McAvoy is leading the search to find a missing young woman and the violent killer of a second. The constant here is McAvoy, the gentle giant and family man, he is the heart of this series. However it feels to me as if Mark has gone above and beyond what you expect in a detective series in the way he has developed the other characters. There is a small cast who make a regular appearance but each book shifts the emphasis, drawing more detail out in turn and filling in the backstories. In this case it’s Pharaoh who we learn more about and see behind her tough exterior, including some revelations about her feelings towards her DS. Mark blends a gritty police procedural with a cast of strong characters and some lyrical prose. The result is a series that seems to get better and better. I notice that in my review for Sorrow Bound I was debating over the number of stars and I’ve gone for 5 here. In fairness to other books & authors this as much about the way the series has developed as this title on its own. If you enjoy police procedurals this is a series you mustn’t miss. This is the fourth in the Aector McAvoy series and it feels as if this is the book that brings the long story arc about the gang of criminals attempting to take over all the organised crime in Hull and beyond into sharp focus. If you’ve read any of Mark’s previous titles, in particular Sorrow Bound which ended on a cliff-hanger, you’ll hopefully appreciate my attempts to avoid spoilers! The police team which featured so prominently in the previous titles is now fractured as its members all deal individually with the fallout from the activities of the ruthless ‘Headhunters’ gang. This isolates the characters and pushes some of them outside the boundaries in which, as part of the investigating team, they had been operating. There are some surprises and twists as we find out a little more about some of McAvoy’s colleagues. McAvoy himself has been on an enforced break and Pharaoh ‘takes pity’ on him and offers him the opportunity to carry out a routine review of an old case. Of course nothing he turns his hand to is ever routine and he can’t leave well alone, so what should be a straight-forward box-ticking exercise leads him to undertake his own full-scale investigation. In the meantime Colin Ray is trying to track down the omniscient man behind the menacing mobile phone calls he’s been receiving and Pharaoh has her hands full pursuing the Headhunters and becomes embroiled in the efforts of some old-fashioned criminals who want to see the back of them. As we’ve come to expect from Mark there are numerous plots and you need to keep your wits about you and pay attention. There’s no waste in his books – every word is important, every action, every character comes into their own. What I missed in this book, though, was the importance of his relationship with Roisin (McCoy’s wife) who has such an influence on him. I can thoroughly recommend this series, but if you read this without at least reading Sorrow Bound first then you might feel at a disadvantage. Thank you to the publisher for the review copy. You can see another point of view at Crime Fiction Lover. I’ve been enjoying Mark’s Aector McAvoy series, and I received this review copy on the recent publication of Sorrow Bound, the third in the series, in paperback. There’s a lot that is familiar from the preceding books – multiple points of view, a couple of plotlines and a present tense narrative. There’s also Mark’s ability to weave together a number of different threads to the story and keep you guessing all the way. It’s a scorching summer in Hull (I was reminded of Ed McBain’s Cop Hater) and whilst everyone is suffering in the heat, the giant that is McAvoy is suffering more than most; his mood isn’t helped by enforced sessions with a psychologist following the events of the previous book. He’s therefore keen to escape and put his efforts into identifying the seemingly random murder of a 53-year-old grandmother on one of Hull’s less salubrious estates. What follows is a police procedural that is more driven by the characters than the procedures, and here Mark excels. That’s not to say that the plot isn’t imaginative and complex. Circumstances conspire to take McAvoy’s boss out of the picture for a while, which leaves him with decisions to make – not something that comes easily to him. What sets McAvoy apart in a fictional world populated by cliched ‘damaged’ detectives who turn to drink (or worse) is that he is straight-laced and not one for bending, let alone, breaking the rules. Were privy to his agonising over which way to turn and Mark really makes you feel for the character. McAvoy’s wife, Roisin, gets an even larger part in this book, although there was perhaps less of them as a couple. There are also some intriguing insights into their original meeting and some loose ends to pick up in the next book (I hope). 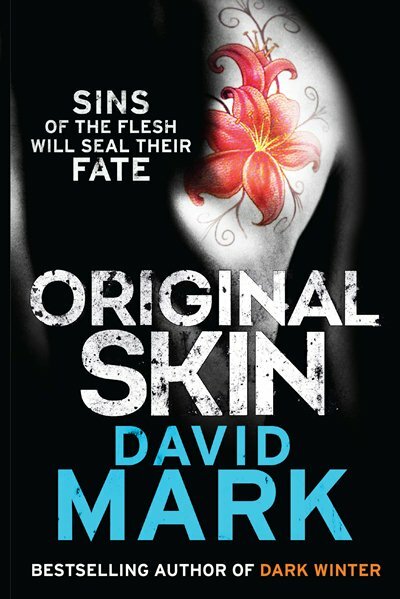 If you have read the title preceding this (Original Skin) there is a plotline that carries on from that book – a reward for those of us who are committed to the series! I’ve seen this described as being the darkest book yet, but I’m tempted to say that I don’t necessarily agree, although the crimes of the main villain are particularly twisted. There’s a large psychological element to the crimes and the criminal, and these are supported by sound reasoning and explanations woven into the story, not something every writer seems to think the reader needs. Mark also manages to inject some humour into his writing and has a style that I find particularly engaging. I was (still am) on the verge of saying that this was a ‘five star’ read, but in hindsight I’m a little disappointed in the final ‘whodunit’. I can see the need for perhaps a 4.5 rating! To be fair to this it is probably my favourite read of the year so far. You can see another review of this title at Crimepieces. Having enjoyed Mark’s debut ‘The Dark Winter‘ I couldn’t pass up the opportunity when the publisher offered me a review copy of the sequel. The opening of the book feels a little disjointed – the death of a young man, the arrival of a group of travellers, a Police Authority meeting, some particularly violent drug-related attacks … and it goes on. It takes a while before the different plotlines become clearer and you can get a better idea of where the story is heading. Despite the slow start, once the book hits its stride, Mark builds on the various plotlines and eventually, skilfully draws them together. Whilst this may be a police procedural the real attraction of the series is McAvoy. He’s the gentle giant of the team, with a strong sense of justice but often suffering a crisis in confidence as to what lengths he might be prepared to go to get the result he wants. In this second novel he finds that he has been left to his own devices when his boss is temporarily out of the picture, allowing him to pursue his own lines of enquiry – not always to everyone’s satisfaction! The story is told from multiple points of view and the main character, aside from McAvoy, is Suzie, a young woman who gets her thrills from sexual encounters with strangers. This is a risky enough enterprise at the best of times but for reasons that aren’t immediately clear Suzie finds herself the target of someone with more sinister intentions. The subject matter won’t be something that everyone will be comfortable reading but Mark has an eye for when to lighten the mood with the injection of some humour. While McAvoy doesn’t have any of the typical vices found in crime fiction he does have his own set of problems. He is enjoying family life to the full, with his small son and new baby girl, but the demands of trying to maintain a ‘normal’ life are putting a strain on both McAvoy and his wife. There is also some unwelcome crossover between his homelife and his work as his wife’s traveller past seems to be something that they are unable to escape. Present tense isn’t to everyone’s liking and Mark’s writing has a lot of clipped sentences which can give quite a stylised feel – but who can resist Aector McAvoy! You can see another review of this title at Raven Crime Reads. When I was asked by the folk at Quercus if I would like to review this debut I only got as far as reading that it was set in Hull before saying “yes”. Despite moving “down South” when I was small, Hull is where my roots are and it’s not often I come across a book set there. Following a prologue set on a supertanker 70 miles off the icelandic coast, we meet Detective Sergeant Aector McAvoy. It’s just a few weeks before Christmas and McAvoy is out in Hull city centre, having a coffee and looking after his four-year old son, when screams from the Christmas service at the church opposite interrupt them. Seeming to forget about his son McAvoy heads towards the source of the commotion and manages to run headfirst into a machete-wielding attacker who has already killed a young altar server. Luckily for us McAvoy only suffers a minor injury, and as his own luck would have it, despite his lowly status, he is the senior officer on call. Thrilled at the prospect of taking the reins his enthusiasm is quickly dampened when (Acting) Detective Superintendent Trish Pharoah cancels her plans so that she can take charge of the investigation. At which point a disgruntled McAvoy finds himself sent on a visit to a bereaved woman as a favour to the Assistant Chief Constable. It soon becomes clear that the CID team has recently suffered some internal problems and McAvoy seems to have been at the centre of the trouble. As they face an increasing body count, McAvoy struggles with his own concerns about his place within the team and the antagonism he perceives towards him. Described throughout as a “gentle giant” McAvoy’s size gives him an advantage over the criminals, who don’t see the gentler side that his fellow officers see, but despite the perception, he’s still no push-over. In fact he actually acts the maverick on the investigations, taking the initiative where perhaps he shouldn’t. But this is because he believes that he holds the key to the investigations and is the only one who can possibly solve the crimes. Of course his ego may be getting just a little ahead of him! He doesn’t have the usual traits of leading police characters – he’s not a drinker, isn’t divorced, in he fact has a seemingly happy home life with a wife he adores, his young son and a new baby on the way. But there is still a secret behind his relationship with his wife that colours their relationship, and impacts on the story. Along the way there’s also a suggestion of some sexual tension between McAvoy and Pharoah – perhaps something that will be resolved in a future book? It’s good to see the setting of Hull being used to the full, and anyone who reads a story set in a location they know well will understand the pleasure you get from picturing the location rather than imagining it. I do hope that Mark uses Hull in the way Peter James does Brighton, rather than the way Craig Robertson does Glasgow! Although this is perhaps an unremarkable police procedural, it is a well told story with an engaging lead character. The writing has quite a lyrical quality to it and in McAvoy I could see shades of a young Andy Dalziel, though perhaps from a more politically correct time! I hope we see more of Aector McAvoy. You can see another review of this title at I Will Read Books.